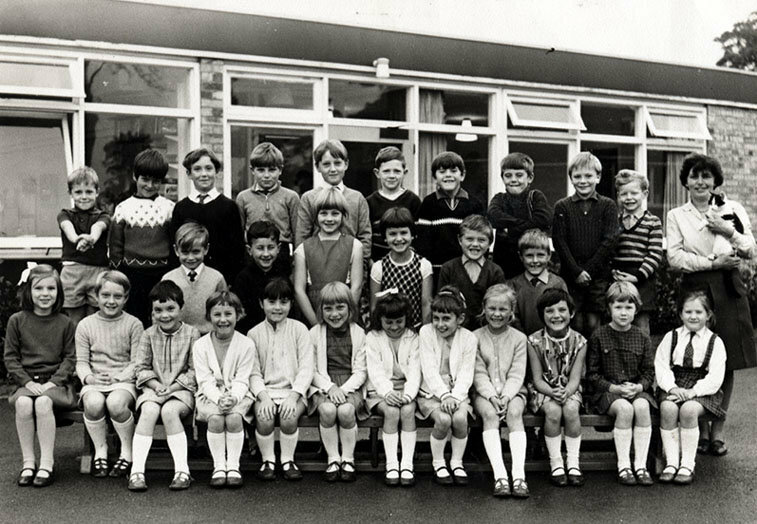 This class photo from the 1970s shows Mrs Watson's class outside their classroom at the 'new' (ie. the present) school. We still need help in identifying some of the children. Back row: Andrew Smith, ?, ?, ?, Graham Westoby, ?, Lowther, Nigel Smith, Mervyn Hornsby, Richard Atkinson, Mrs Joan Watson. Middle row: Mark Atkinson, Ian Cowburn, Virginia Atkinson, Ann Cowburn, Martin Kay, ? Front row: Dawn Lilley, ?, ?, Sandra Hall, Glenice Wraith, Brown, ?, Boville, Sally Wilburn, Robinson, Helen Martinson, Dorothy Chapman. Back to Eastrington school history.